The GoPro accessories market is estimated to be $347 million out of the $612 million action sports camera accessories market. 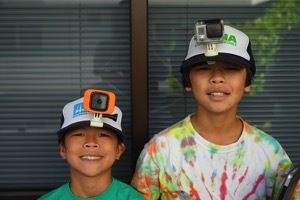 The students designed two prototypes for a removable and adjustable GoPro camera hat mount. The prototypes were then 3D printed by mentor Collin Kobayashi, CEO of 3D Innovations. Then they took the prototypes to potential customers for feedback. A video documenting their work can be found at Menehunes.co. The other members of the team are Monica Umeda, co-founder of Akabotics, Kari Leong, teacher and CEO of Bubble Tea Supply, and Evan Leong, founder of StandUpPaddleSurf.net. The top three teams from each region now have the opportunity to compete against each other for a chance to participate in the final round in Barcelona, Spain. Starting on November 28, 2015, you can vote here.